The Divine Service is at the heart and soul of what we do at Trinity. We are a community that gathers to worship our Lord and Savior Jesus Christ. We gather together each week to receive the gifts that God has for us: the forgiveness of sins, eternal life and salvation. We also believe that the support one Christian gives another is a vital part of a worshiping community. On Sunday mornings we follow the Divine Service from the Lutheran Service Book. During the seasons of Advent and Lent we use Divine Service III (the old page 5 and 15 from The Lutheran Hymnal). Advent and Lent are more reflective times of the church year lending towards the tone of Divine Service III and the omition of the Hymn of Praise. During the seasons of Christmas, Epiphany and Easter we use Divine Service I which is more upbeat and includes the extended version of the Hymn of Praise. During the none festival portion of the church year (Pentecost) we use Divine Service II. We are blessed to have three pastors who preach on a regular basis here at Trinity. Pastor Heinert usually preaches the third Sunday of the month and Pastor Jennings and Pastor Gehne switch off every other weeks. Each has his own style of presentation and each one takes the craft of preaching seriously. Our worship on Saturday evening at 5pm is "relaxed." We follow the same general order of service as on Sunday except that the liturgy or musical accompaniment was written by former Racine Lutheran High School band and choir teacher Peter Klemp. Worship on Saturday is generally led by piano rather than organ (with the exception of Easter Vigil). The Pastors generally wear suits and clerical collars (black shirts with the white tab) rather than robes. The Lord's Supper is served at the 10:30 service on the first and third Sunday's of the month (9:30 during the summer). 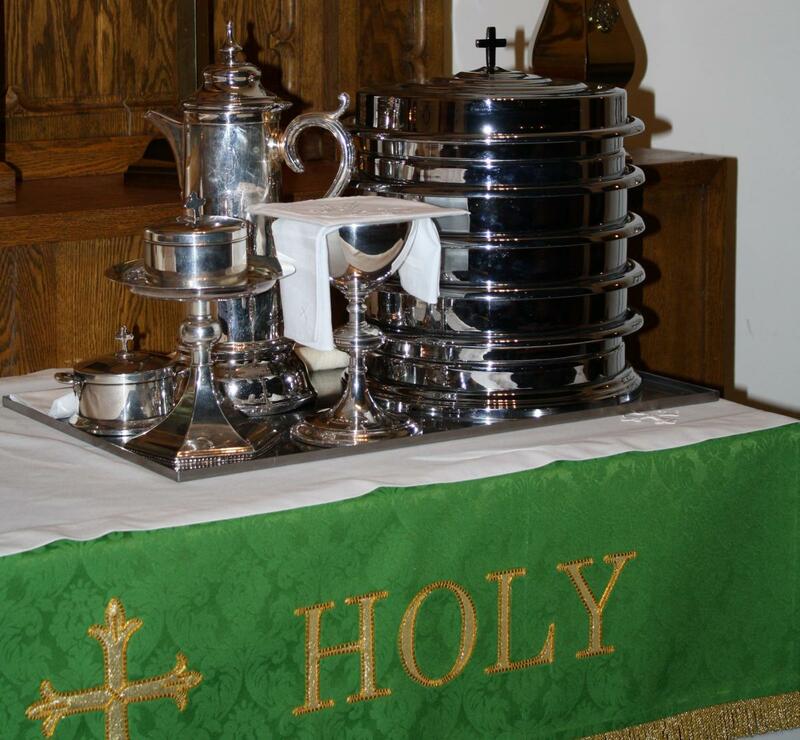 The Lord's Supper is served at the 8:00 service on the second and fourth Sunday of the month. We do not celebrate the Lord's Supper on the fifth Sunday of the month. To tell you when Communion is served on Saturday is a little more difficult. Basically, look at the church callendar and if you see Communion offered at 8:00 on Sunday morning, it will be offered the night before at the Saturday service. We offer both the individual cups and the common cup for the reception of the wine. Please note, that the clear glass in the center of the individual cup tray is water with just a drop of wine. We have determined that this is the best option for those on medication that reacts with alcohol and those with a history of alcoholism. Beginning June 1st and ending August 31st each year we change our worship schedule slightly. Our Saturday service remains at 5pm, but our Sunday services move to 8:00am and 9:30am (rather than 8:00am and 10:30am). This is done because we don't offer Sunday School or Adult Bible Class between services during the summer as we do the rest of the year and since we don't currently have air conditioning in the church, we are able to conclude worship just a little earlier in case there is warmer weather.